This is a transition record, my first one with songs in Portuguese, and the last one I released as Walden. 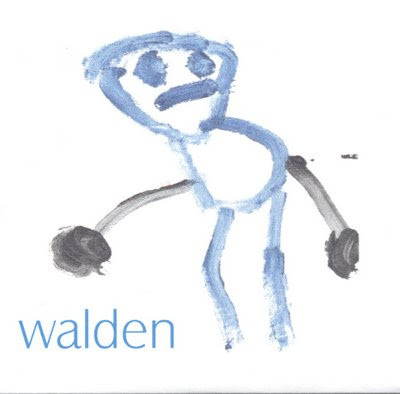 After this Walden became Zanin and I increasingly came to make more experimentalisms and mostly electronica-oriented music, at least for the next 4 years. When I was recording these songs, my son Lauro, 5 at that time, was really curious and eager to participate in all that I was doing with those instruments, the portastudio and the computer etc. So, despite all the lyrics being totally unrelated to Lauro, he always was with me while I was recording and was important to the making of the record, both playing his toy keyboard and singing with me as drawing the cover. My friend Neri da Rosa from Curitiba’s radio show Ultimo Volume made the graphic design. The words I sing in Pronto, O Escandalo are an excerpt from Sartre’s The Age of Reason, even as I wrote Náusea inspired by the famous French philosopher work. The words for Tarde I wrote while working as a guard in a reformatory in Sao Vicente. Insone was a selection/adaptation of some lines I had written some 9 years before.